This video shows you how to barge in to a call on a Samsung SMT-i5210 IP handset. Have you ever wanted to listen to a call someone else in your office was making? Your Samsung telephone system has a great feature, called barge in, that will allow you to do just that. If this doesn’t work on your system then call us on 0800 652 8052 and speak to a member of our team to make sure you have the barge in feature enabled on your telephone system. 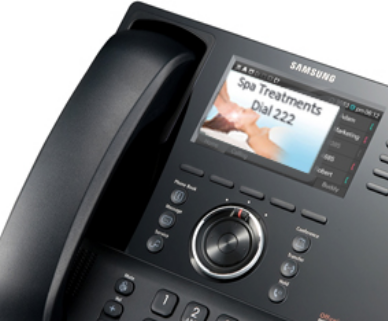 Here at Telephone Systems Direct we specialise in Samsung telephone systems. We have a whole host of Samsung OfficeServ user guides as-well-as many manuals on older platforms such as the DCS and iDCS ranges.Â You can browse through our documents section to find guidance on Features, Facilities, Administration Commands as well as Installation instructions – BUT BEWARE – you’d be sensible to let the professionals perform installations, as they can do it far quicker than you, and you’ll get the most out of it for a very small outlay. Purchasing spares and additions for the OfficeServ 7200 is simply by clicking the link to enter our online shop where you will discover that we provide 25% OFF on nearly all of Samsung’s phone system products from the entry-level 7030 right through to the enterprize class 7400. Feel free to call our team on 0800 652 8052 on any matter on the Samsung OfficeServ 7200 manual, on Lines & Minutes, or just on Support – we’re Platinum accredited – but we don’t charge a premium for that – purely good service throughout the UK. Great inventions donâ€™t come along too frequently. Take Dyson for example, the vacuum impresario only designed the bag-less wonder around a decade ago and now where would we be without them. Itâ€™s the same with iPhones and some hotel phone systems. When it comes to any sort of training, it is a known fact that people retain more of the training if the training consists of both audio as well as visual material. Training your staff for your business, so that they can perform their duties better can be done either by sending your staff to training courses, or by inviting a trainer to train them at your place of work, get them to do online training or to get them to watch training videos. Video training is becoming really popular online. It used to be something reserved to schools and training companies, but now with sites like YouTube, people realized that there’s no training material available for free to everyone. Whether you want to enhance your own skills, or if you own a business and you want your employees to be trained, then you no longer have to pay large fees to enroll in an evening class, and instead you can use free video training material that you can find online. And, if you own a web site, you can use that material in some clever ways. Give a man a phone and he could screw up your business. Teach a man to phone and revenues will flourish. Here you will discover how you can develop their skills for free via 20 short telephone training video clips that will enhance your mastery of the most commonly used instrument in our businesses. Modern VoIP phone systems give you everything. Back in the 1980â€™s when CTI was in its infancy, linking into company databases was a difficult operation.Â Not many companies had the funds for it.Â Now, itâ€™s straight-forward and cheap. The applications that have sprouted since the turn of the Century have been incredible.Â You only have to consider that the Internet has transformed the delivery of our information in in just over a decade. Voice recording is another application that was tremendously expensive in the twentieth-century.Â Probably in excess of Â£10,000.Â For little more than Â£2,000 you can record all the conversations over a thirty channel ISDN pipe for all extensions.Â Thatâ€™s how much cheaper thatâ€™s become! Some manufacturers will provide generic phone systems application-packs plus industry specific ones â€“ for instance on the Samsung OfficeServ7000 series there are dedicated programmes that cater for Hotels, for Call Centres, Healthcare and Taxi Firms. So when youâ€™re thinking that it might be time to be shopping round for the latest in phone systems, explore not only the handsets and phone features that control calls, but be aware of the peripheral apps that can transform the way info is presented to your staff to make them, and you, more effective. In some instances you could be offered a starter or taster session which is free â€“ if so, do it â€“ it may open up possibilities that youâ€™d thought you couldnâ€™t afford â€“ but actually can. To talk about this, or any other phone systems topics â€“ you can chat to our team on 0800 652 8052. Phone systems are not the most exciting products on earth letâ€™s face it. They sit on your desk all day, get utilized to the best of their abilities, suffer abuse due to not being able to be used correctly, may have the odd bruise from having been slammed down and are just there to make you look busier then you actually are. Whether you are using a hotel for business or pleasure itâ€™s always wise to see what their phone systems have on offer. Many hotel owners are investing in their phone systems which can show their guests what facilities the hotel has aside from the usual places and bars. Modern hotel phone systems can flash images of other opportunities and convention products which can be utilized at the touch of a button.